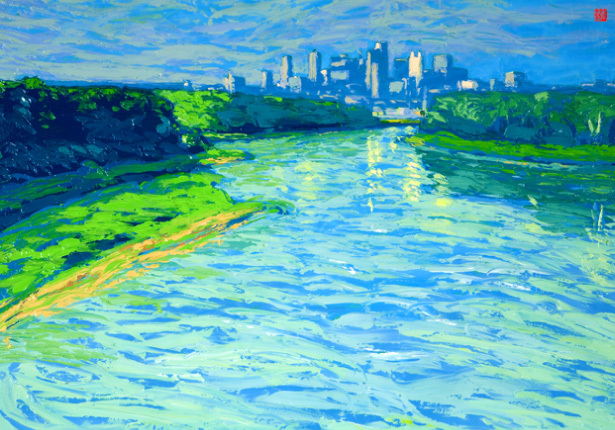 Introducing artist Allan Chow whose paintings will light up your world! Enjoy this insightful and poignant interview. 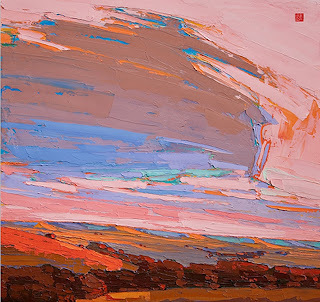 Allan Chow (born April 22, 1979) is a Malaysian Chinese born landscape painter who currently resides and owns a studio in the United States. Allan received his BFA in Illustration from the Kansas City Art Institute. Mentored by Illustrators, Allan worked as a freelance Illustrator and Graphic Designer during his twenties while he experimented with paint after dark. He spent many hours after work struggling to find his identity as a Fine Artist. 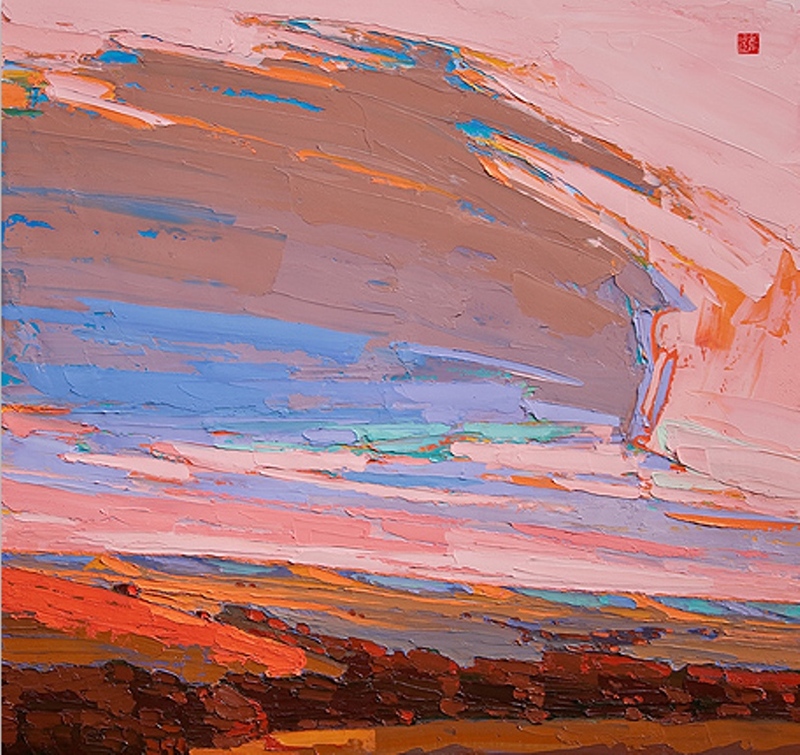 However, his natural attraction to Impressionism and Abstract Expressionism inspired him to develop a modern interpretation of landscape paintings with a palette knife. Allan's hints of Southeast Asian culture manifests through his exuberant colors, bold paint strokes and irresistible textures that set him apart from his peers and made his paintings one of the most preferred and collected in the country today. 1) Allan, when did you first realize you had the desire to paint? During my third year as an Illustration major, I was desperately trying to give myself some painting exercises to learn about color theory. On top of my Illustration assignments, I remember staying up till 5am every night working on paintings of my native country, Malaysia. It was pure Art for Art sake. I didn’t care if it sold or not. I painted because I wanted to learn how to mix paint. 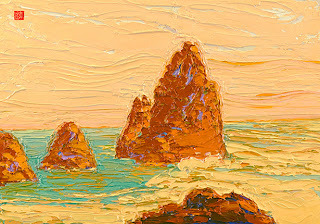 I turned to paintings by Monet, Van Gogh and Childe Hassam. 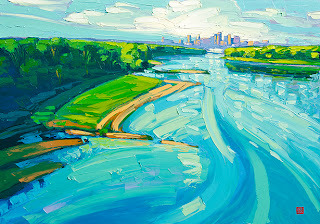 I learn by borrowing their impressionistic color palette, style and incorporating them into my paintings. It was a series of ten paintings. That same series of paintings got me my first exhibition and also they got me into my first gallery representation two years later. 2) What inspires you to begin a painting and what is your methodology? It is such an emotional and moody process. I am most inspired to start a painting right after completing an emotionally draining painting that I spent the last month or two struggling with. This momentum happens usually in the middle of preparing a show of 30+ new paintings. If I plan a painting from start to finish, I am less excited at the end and will most likely lose interest. To avoid this, I paint whenever I feel like an idea is ready and I keep my drawings very minimal. I just push paint around until something speaks to me. I work through mistakes and disappointments but embrace happy accidents and build on one victory at a time. Eventually, everything will work out. Tons of texture and layers of colors for visual interest is present. Most importantly, the final result is appreciated so much more. 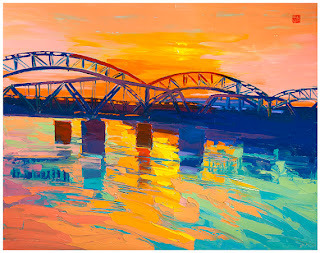 3) Bright color and the palette knife are two signatures of your style. Would you tell our readers more about that? 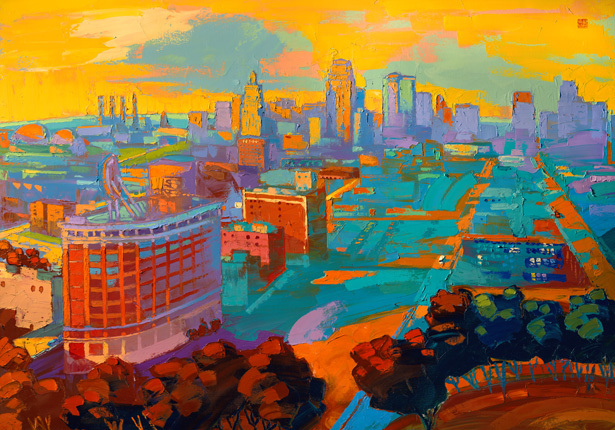 Oh and I do love your images of the Kansas City area. I was particularly drawn to muted and dark color palettes a decade ago while I was studying some impressionists’ work. The more I painted, my natural instincts and personality gradually reflect in my work. I am an optimistic person. I want my paintings to be bold and filled with energy affecting people positively. This explains the color palette I am using today. As far as my style, it is constantly evolving and hard to explain. It really is a work in progress. It changes when either a new subject matter or medium presents itself. I have learned to let go and refuse to control much these days. The more I let go, the more I discover. I know I love texture so a palette knife made sense. The difficulty of controlling paint with a knife forced myself to pay less attention to details. It really freed my wrists and encouraged myself to work more with my entire body. The deal breaker for abandoning a brush was that I didn’t have to wash them and I no longer have to smell turpentine. 4) Are there artists or others that you admire or consider mentors in your journey? Absolutely! I admire Impressionists such as Childe Hassam and Monet the most. Some of my favorite Artists are John Singer Sargent, Edward Hopper, Aaron Siskind, Franz Kline, Howard Pyle, N.C Wyeth and Andrew Wyeth to name a few. One of my mentors in the past is an Illustrator who paints. He gave me the confidence to do both. My most recent mentor is a Graphic Designer and Instructor. He is probably the most giving and committed person I know. They both have different strengths that I admire a ton. I aspire to be the best I can be as an Artist. At the same time, it is important to be humble and inspire others. 5) You are a world renowned artist and have paintings in many important collections. What are some of the corporate and private collections where your art is featured? You are too kind. 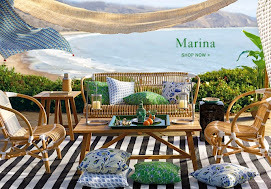 Some collections that I could think of are H&R Block, Kauffman Foundation of Kansas City, Intercontinental Hotel, BKD; Lewis, Rice and Fingerish Law Firm, the University of Kansas Medical Center; Russell Stover Candies; and private collections in Kansas City, Seattle, California, Hong Kong and Malaysia. 6) I understand you take consignments and have amazing art available.How may readers contact you who are interested in your art? 7) Finally what would you tell the person who feels that creative spark to paint? As a hobby, I recommend everyone to try to paint for fun and be free. I believe as human beings, being creative is innate. Find a medium that you enjoy and just have fun. Professionally, I would advice young Artists to know the difference between TALENT and SKILL. Talent isn’t enough to get you by. The skilled are those who are willing to persevere and risk it all to pursue your passion. 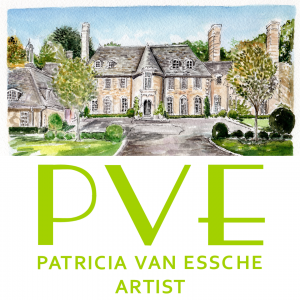 Being a skilled Artist will ensure long-term success and personal fulfillment. Thank you so much Allan. It has been such a pleasure to include you in The 2013 Artists Series. Dear Readers and Followers I hope you will visit Allan's website ...and come comment on what works of art are your favorites. Allan also does still life paintings as well as his renowned landscapes. Your support of the art world makes this world and our communities a better place to live! Thank you with all of my heart for your encouragement. Look forward to the next Artist in our 2013 Artists Series. 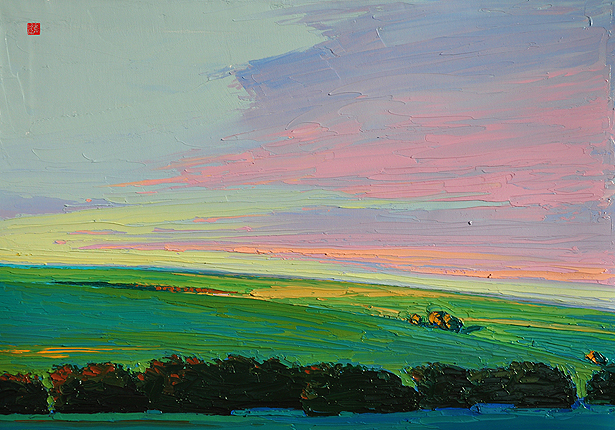 I love Allan's distinctive style - the way in which he applies paint and colours to draw the eye into his subject. I'm sure we will see more of this fine artist on the world stage. Your interviews are so revealing and really get to the hearts of the artists you feature here. Thank you for another great post. Wonderful! 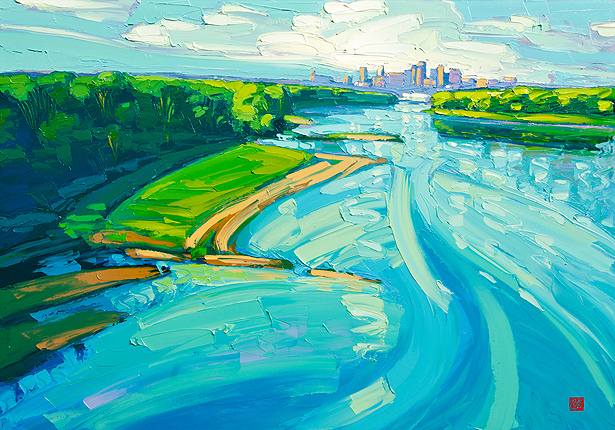 as some one who calls Kansas City his second home, I enjoyed Allan's interview and his art. How many times have I driven over the Broadway bridge . Love "Safety of the Sunset". I love the texture and colors that he uses, thanks so much for sharing such a talent! WOW...now there is an ARTIST! His color choices and light magic are a good pick-me-up for this cold day! Great interview...love the bridge! Enjoyed reading about his process. Keeping you in my thoughts and prayers. Beautiful work, Allan, and lovely interview, Karena! I tried the palette knife a little but it's actually pretty difficult, so I am even more impressed by these lovely paintings! I love the color and his list of artists that have inspired him! Happy Belated New Year Karen :D What a wonderful interview. I love Allan's use of color and his art has an almost illustrative feel to it. I liked the piece "Morning Missouri" and I especially especially love what Allan said at the end about the difference between talent and skill. I whole heartedly agree with him. I read 2 books about talent last year that changed the way I view "talent." An artist who is balanced, level headed and has work ethic. He deserves his success. Really love Allan's paintings. The color palette is great. Hi Karena, This artist is exceptional. I would love to own his work. Thank you so much for opening my eyes. Wow these are just stunning. Love the colors! So vibrant and alive. Spoken like a true artist when he said he didn't really care if they sold or not that is was much more about the process and journey in learning....excellent interview! Karena, Allan's painting are fabulous! I love his interpretation of the subject he is painting! The use of color is amazing! Thanks for sharing his story and work! Oh my! I think that this amazing artist is my favorite of all that you have profiled! He looks like a golfer! That's the best kind of up and coming artist..the kind that grab you in so many ways! I hope you are doing great!!! Always love your wonderful posts! IM IN LOVE! Karena, thanks for introducing me to him, he is phenomenal!!! going to his site now..have a great weekend! I love his fluid style. Thank you for introducing us to him. Hugs! 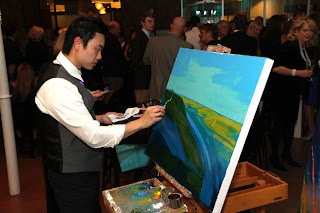 Of all the paintings I've done, I have never tried it with a palette knife. Thank you for the inspiration with Mr. Chow's work. information. I аm hаpρy that you sharеd this useful informаtion with uѕ. Plеase stay us informed likе thiѕ. The colors are amazing. I love how you post the most beautiful art! As someone who has zero talent in this area, I have the greatest respect for artists who follow their calling. So much is involved to learn technique, stay motivated and find the time to do it all. Allan seems aware and focussed on his craft which is why he has had success! Congrats to him. Allan is one of my favorite artist's. The bold strokes of color just blast off the canvas. I've had the good fortune to see many in person at the Leopold Gallery and I never get enough. GREAT interview Karen!! Karena thanks for sharing this incredible art.. I love his style, use of color... generally very uplifting interpretations of everyday sights... brilliant! Beautiful paintings... full of energy and light.. 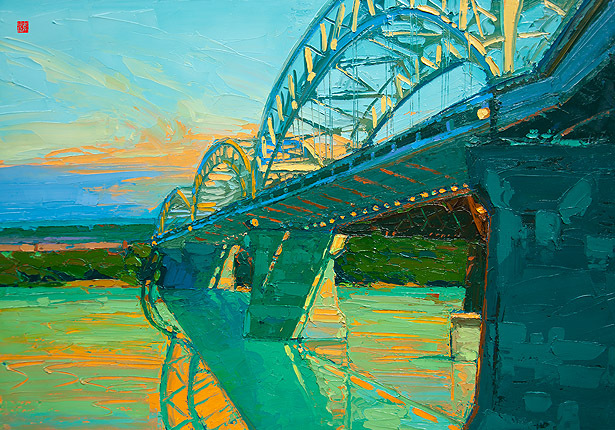 It is sheer magic how a palette knife artist can produce such fine paintings. I like his work and use of color and texture! I especially love Morning View and Morning Missouri. We have lots of family and friends in and near Kansas City, so I will be sure and let them know about this talented artist in their midst! How do you always "wow" us with such exceptional artists? I love reading these posts and it's actually giving me an idea of how to interview the artists that we currently represent. I love this and I'm so glad I saw it! thanks for sharing! I really like his work, Karena! The MORNING VIEW is something I would so hang in my room. Thanks for the introduction..you are a great talent scout! Yours is a magical world, my friend! You will be in my constant prayers. I am also calling my prayer group nd putting you in our network! Thank you for introducing us to such interesting and talented artists. 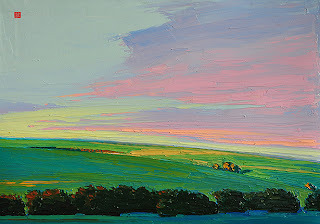 I am very drawn to Morning view, the broad landscape, the colors..it is a beautiful interpretation of the beauty of life. Thank you Beautiful Karena, for taking the time to visit my little art piece. Where do you find the time to spread all the love that you do so graciously. My dear friend you were in my prayers that moment, I am praying that you are sheltered in his glorious wings, that blessings are bestowed upon you, and your health is the biggest one restored. Keep walking in faith that through him you will be blessed. I am adding you to my friends prayers as well. See you and all the beauty you grace, and the joy you bring. These are such uplifting paintings and the colours are so rich and vibrant. I particularly like Safety of the Sunset - wonderful post! I work through mistakes and disappointments but embrace happy accidents and build on one victory at a time. Eventually, everything will work out. What a positive attitude he has, and it shows in the work. Wonderful! However wishing you all the best, take care. Beautiful work! I love his use of color and graphic quality. Thanks for sharing this artist Karen! Such gorgeous paintings! Thanks for sharing your work and making the world a more beautiful place! His Facebook account was suspended.